When life gets busy it can be hard not to reach for something sweet at the checkout line or grabbing that chocolate chip cookie to go with your latte. That's why I suggest keeping a couple healthy snacks in convenient places so you are always prepared when hunger strikes. This will help you make it till your next meal and not have you so tempted by those not-so-good -for-you treats that sneak into our mouths and bellies when we are rushing around hungry. One of the most portable and tasty snacks I love having with me are energy bites. They are so simple to make and a great way to pack in a lot of nutrients. Energy bites are made with just a few ingredients but taste divine. Nutty roasted almonds and sweet medjool dates make the perfect base and from there the options are endless. Today, I'm sharing with you my recipe for a cacao spirulina version. I like making these energy bites on the weekend so I have them to grab during the week when life gets busy. You can keep them in the fridge for about a week or two or you can put them in the freezer for a month. I call these energy bites but they can definitely be considered a healthier dessert option. It's the perfect thing to satisfy that sweet tooth you might get after dinner. I recommend making a pot of tea, sitting down and savoring the nutty, yet sweet and chocolatey taste for the ultimate experience. Plus, Spiral Spring spirulina is gluten-free, certified kosher, USDA organic, non-GMO. For more information about the company and their standards, you can check them out here! 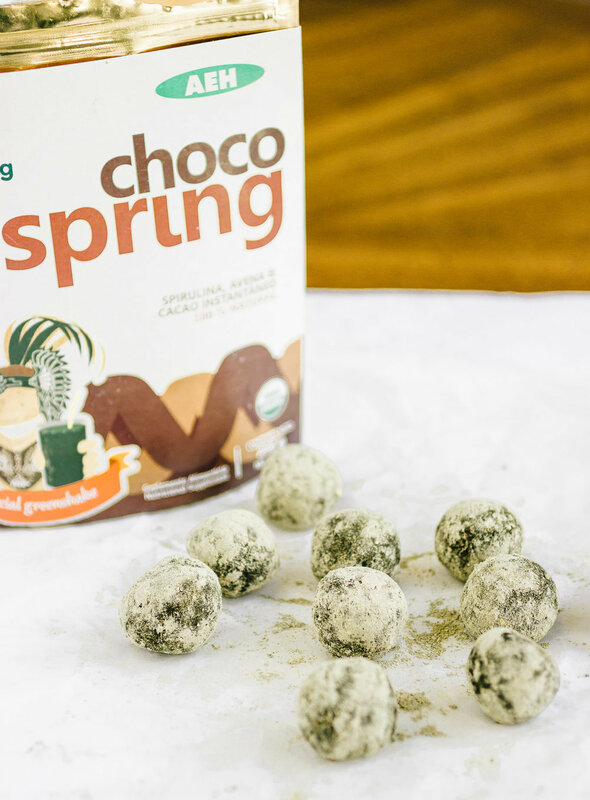 For this recipe, I use Spiral Spring Choco Spiral powder to give these energy bites a rich chocolatey taste that is also loaded with nutrition from spirulina. I've been hesitant to continue trying spirulina in my recipes because I haven't previously had much success. I was having trouble finding a recipe where I couldn't detect a slight sea-water aftertaste. (If you have a recipe you love, please share!). However, I must say I love this recipe and it's all thanks to Spiral Spring Choco Spiral powder. This superfood powder is truly unique. It's a combination of cacao, oat flour and spirulina, which by the way is completely undetectable. Dates and almonds are combined with Spiral Spring's unique chocolate spirulina powder to create a sweet chocolatey energy bite full of good-for-you ingredients. Place the almond in a high speed blender or food processor until they are broken down to what looks like small crumbles. Add the rest of the ingredients until all the dates are broken down and a thick paste is formed. You may need to scrape down the side of the blender or food processor as you go. Roll into tablespoon sized balls. Place 2 tablespoons of Spiral Spring Choco Spring Powder into a container with a lid. Place about 5 balls in the container at a time and give it a shake so the balls are coated in the powder. Repeat with the remaining balls. This post was sponsored by Spiral Spring but all opinions are my own. If you want to try Spiral Spring Choco Spring powder head on over to their website here and use the code nourish20 for a awesome 20% discount!